I got this stuff a while ago, but I'm finally getting around to reviewing it now. I picked up all of these items at 75% off. All this stuff is from the 'for Target' lines of makeup, basically spinoffs of high end brands. 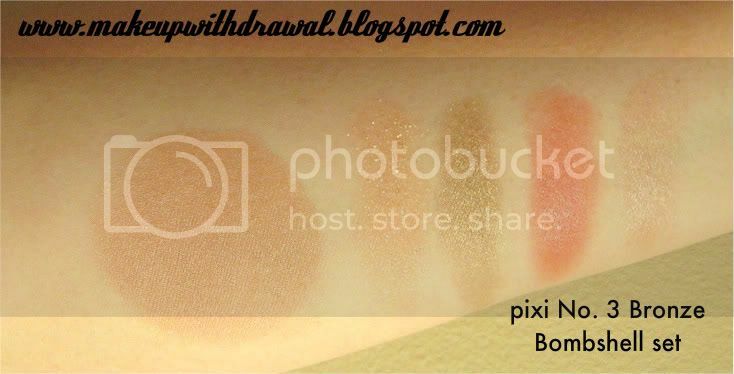 I've tried NP Set (Napoleon Perdis) and pixi by Petra (pixi) before, and wanted to dip my toes into more of the stuff. The first thing I got was a pixi palette with a little travel case in No.3 Bronzed Bombshell for around $7.50 (orig $30). Let me just start out by saying that you'd have to be out of your mind to think that this is worth $30. 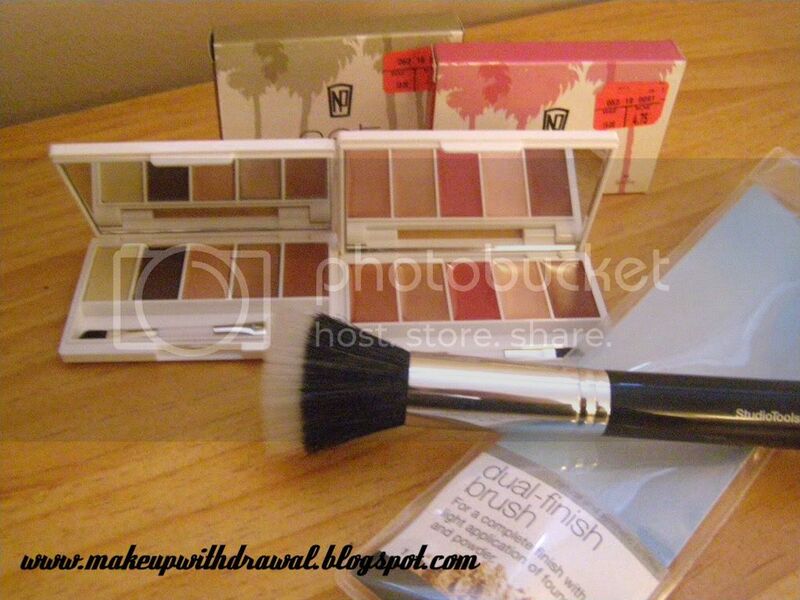 The little makeup case and brushes are incredibly cheap feeling. However, I'll still use it because... I don't have anything better! The palette itself, I'm feeling a little iffy about. I'm a bit puzzled to be honest. The title, 'Bronze Bombshell' makes me expect, well bronze and various shades of metallic colors. The blush is a sheer brownish rose, the eye shadows are orange coral and brown, and the lip colors are again, a dark shimmery rose brown and a dark strawberry. I was highly disappointed with the shadows, the coral one has disgusting chunky gold glitter and while the texture of the brown is excellent, it's very sheer and shimmery while I had hoped for more opaqueness. The lighter lip color just shows up with a hint of shimmer on me, no pigmentation there at all. The darker color is a nice surprise, it's actually a lovely cool strawberry, something you don't see all that often that is very opaque and creamy. Now for the best part- the blush. It's soft and buttery feeling, it has such a nice consistency, I wish it was sold by itself. Actually, I ended up depotting the blush for my blush palette (it wasn't hard to do, thanks to the cheap packaging- it popped right out).I get one good blush and lip color out of it, and I think altogether it's worth $7.50 (barely) but I wouldn't pay anymore for it. I bought two NP Set palettes for $4.75 each, what a deal (orig $19)! One is Wanderlust Must (right) and the other is Bon Voyage Baby (right). Wanderlust Must contains all glosses, while the other contains 3 shadows and two glosses. I'll be perfectly honest the sheer glosses look really similar on my lips, with only slight variations in darkness to really tell them apart. The more opaque colors are really nice, good pigmentation and interesting colors that I probably would have never bought on my own. The three shadows in Bon Voyage Baby make me really happy, I've always wanted a light yellow like that, that wasn't too cool or too warm but just right. The brown and shimmery golden orange shade are nothing special, but nice shades none the less. Overall, Bon Voyage Baby is great for when I'm too lazy to properly coordinate shades. I'll do a look with it soon. The lip colors are used up way too quickly though- they're so soft and seem to melt at warm temperature because it's quite gooey every time I dip a lip brush in them. So I would definitely not pay full price for them. Good steal on clearance! Oh yeah- did you see my Studio Tools Dual Finish Brush? I've been looking for this highly elusive skunk for YEARS. No joke, capital letters worthy. I'm literally mentally shouting. And when I found out that it was being discontinued, I was really sad because I figured, "There goes my shot at finding it!" However, the makeup gods were on my side that night, because I finally saw one at Target (last one!) and picked it up on clearance for $3 and change. How about you? Ever get anything great at Target on clearance?